Fast-acting and odor-free, erases the discoloration caused by high heat or food spills. Easy to apply, rinses off completely, and is gentle enough for everyday use. 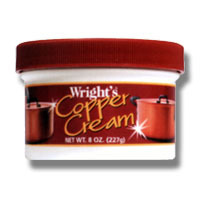 Fast-acting odorless product designed for copper cookware and heavily tarnish copper and brass. For all copper cookware. Specially formulated for daily use.